A woman with a substantial risk of breast cancer recurrence experiences worry and anxiety, and a correct diagnosis is relevant in order to make well-founded decision on treatment strategy. It is then crucial to provide accurate diagnostic work-up in such patients with suspected recurrent disease. Although current guidelines do not recommend imaging other than mammography after primary treatment of breast cancer, diagnostic work-up is recommended when clinically indicated. There have been no clear recommendations about which imaging procedure is best for detecting recurrence. Fig. 1. A patient with verified bone metastases detected by FDG-PET/CT only. The arrows show lesions in the ribs diagnosed as bone recurrence on FDG-PET/CT. The bone scintigraphy (BS) and CT were both false negative. The patient was confirmed to have bone metastases on follow-up with further imaging that showed progression of bone metastases. (A) BS in anterior and posterior projection. 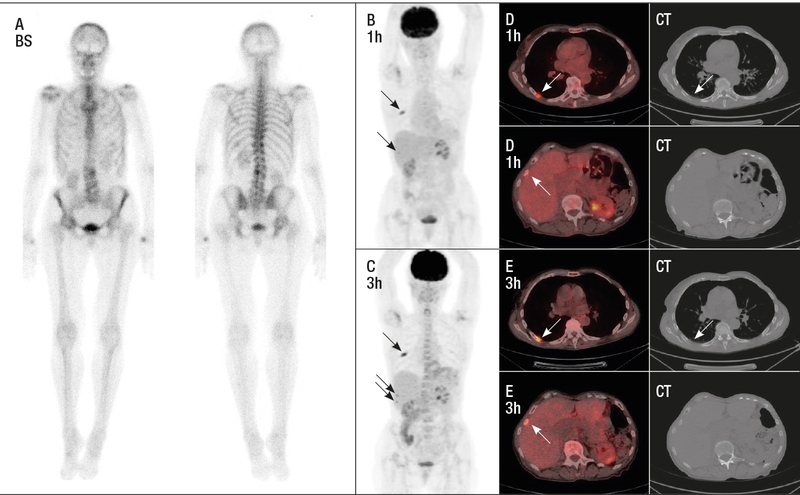 FDG-PET/CT at (B) 1 hour (1h) and (C) 3 hours (3h) after FDG injection. Transaxial images of at (D) 1 hour after injection, (E) 3 hours after injection, and low-dose CT scans. Conventional diagnostic work-up often includes combined imaging procedures, but a modern stand-alone-procedure may provide more accurate diagnostic information. BS (bone scintigraphy) and CT (computed tomography) are conventional procedures, and FDG-PET/CT is a modern imaging procedure that stands for 18F-fluorodeoxyglucose-positron emission tomography/computed tomography. FDG-PET/CT is a functional imaging procedure that uses radioactively labeled sugar molecules to detect cancer. We performed a diagnostic study of 100 patients with suspected recurrent breast cancer. FDG-PET/CT was compared to conventional work-up procedures. A comparison was also made for FDG-PET/CT between imaging at one hour and three hours after injection of the radioactive sugar, FDG. Biopsy and clinical follow-up determined whether patients had recurrence or not. Of 100 women, 22 endured distant recurrence, 19 had local recurrence only, and 59 women experienced no recurrence. When we obtained a negative test result on FDG-PET/CT, we were able to rule out distant recurrence, since all patients with distant recurrence were detected by FDG-PET/CT. In comparison conventional work-up overlooked distant recurrence in two patients. An example of a patient with bone recurrence who had false negative test results on conventional work-up has been shown in Figure 1. Fig. 2. Receiver operating characteristic (ROC) curves and area under the ROC curve (AUC-ROC) for imaging modalities in the diagnosis of distant recurrence (n = 100). The diagnostic accuracy of a test can be estimated by the area under the ROC curve; hence a perfectly accurate test is running in the upper left corner. 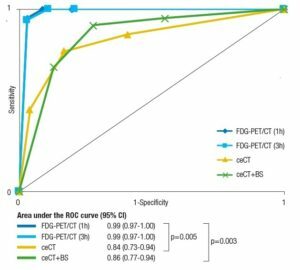 The figure shows that FDG-PET/CT very accurately confirms and excludes distant recurrence, and that FDG-PET/CT does this significantly better than the other modalities. The two blue curves have almost identical patterns meaning that one hour and three hour imaging of FDG-PET/CT express no difference in diagnostic accuracy. Seven women were falsely diagnosed with disease recurrence by FDG-PET/CT. In contrast conventional work-up resulted in 22 patients with false positive test results; these were mainly caused by false positive liver lesions on the CT scan and false positive bone lesions on the BS. 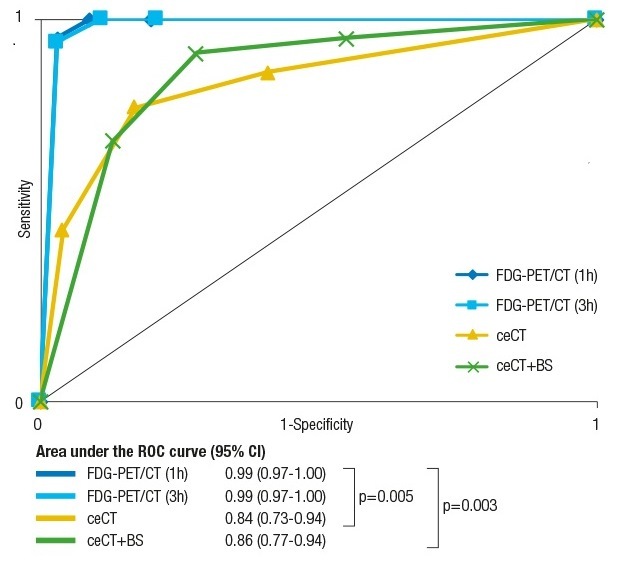 FDG-PET/CT proved to be significantly more accurate in diagnosing distant recurrence than conventional work-up as illustrated by AUC-ROC curves in Figure 2. Surprisingly, however, one hour and three hour imaging results of FDG-PET/CT were almost identical. We conclude that FDG-PET/CT did well in diagnosing breast cancer recurrence and better than conventional work-up. Since FDG-PET/CT serves as a stand-alone-procedure, it may also be advantageous to conventional work-up that requires more than one procedure. Our study was carried out in a single institution with experience in performing PET since 2006, and caution should be made when generalizing from our results. A synthesis of results from proper diagnostic studies along with economic and organizational assessments is needed before generalized conclusions should be drawn. Furthermore, the patients’ perspective on implementing FDG-PET/CT should also be taken into account. The Region of Southern Denmark funded this research. The authors made no disclosures. [18F]Fluorodeoxyglucose (FDG)-Positron Emission Tomography (PET)/Computed Tomography (CT) in Suspected Recurrent Breast Cancer: A Prospective Comparative Study of Dual-Time-Point FDG-PET/CT, Contrast-Enhanced CT, and Bone Scintigraphy.